I was telling someone the other day that every computer I’ve bought has cost about $700-800, even though they keep getting more powerful. You can spend a lot more than that, of course. 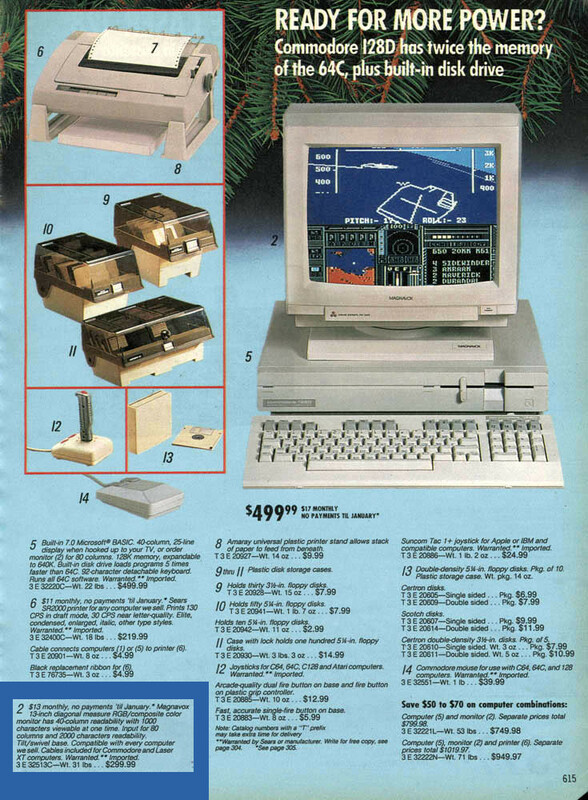 But it seems like each time I put together a system with current proven hardware that’s plenty powerful for my needs, the price ends up in that range, going back to my first computer in 1988. Then I got to wondering whether that’s really true. That’s a pretty old memory, so is it accurate, or something I dreamed up over the years because it sounded good? I went hunting online and found the Sears Catalog page from 1998 below, which matches up with what I remember. I bought a 128D and monitor from Sears just like the ones in the picture. According to that, the computer was $499 and the monitor was $299, but there’s the combo price in the lower right: $749.98. I don’t remember what accessories I bought, if any. I know I didn’t get a printer, but I probably got a joystick and some blank floppy discs. That was a fun little nostalgia trip, since that was my computer until some point in the late 90s. Even after I got into the Internet business, I would connect to the Unix systems at work using a terminal on the 128 at home, so I used it for nearly ten years. Aside from nostalgia, I’ve been thinking about that system because, since I got back into assembly programming a little, I was surprised to find out how much is still being done with the 6502 family of CPUs used by so many of the top 1980s systems. They’re apparently pretty popular in embedded systems and some of those hobby mini-computer boards, so I’d say there’s more interest in them now than there was 10-15 years ago. That looks like another reason to do some assembly language tutorials or other videos like I mentioned in my recent C programming series. More to come on that soon.